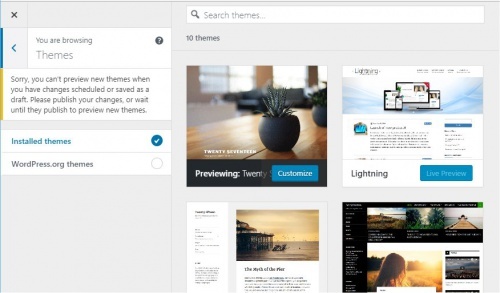 An incremental improvement to the media changes hatched in WordPress 4.8, you can now add a gallery via widget. Yes! One very longstanding request—for over 8 years is finally implemented in WordPress Version 4.9. It is no longer required to have plugins and themes do add_filter( 'widget_text', 'do_shortcode' ). We’ve made numerous improvements to the Customizer JS API in WordPress 4.9, eliminating many pain points and making it just as easy to work with as the PHP API. There are also new base control templates, a date/time control, and section/panel/global notifications to name a few. Check out the full list. WordPress 4.9 includes an upgraded version of MediaElement.js, which removes dependencies on jQuery, improves accessibility, modernizes the UI, and fixes many bugs. New capabilities have been introduced that allow granular management of plugins and translation files. In addition, the site switching process in multisite has been fine-tuned to update the available roles and capabilities in a more reliable and coherent way. The singular activate_plugin and deactivate_plugin capabilities are used along with the corresponding plugin name when determining whether or not a user can activate or deactivate an individual plugin. A PHP edit that introduces a fatal error is rolled back with an opportunity then for the user to fix the error and attempt to re-save. indicating when a widget has been successfully saved and showing an “Are you sure?” dialog when attempting to leave without saving changes. 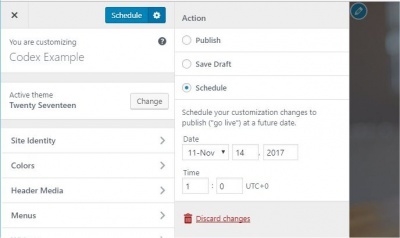 Drafting (#39896) and scheduling (#28721) of changes in the Customizer. Once you save or schedule a changeset, when any user comes into the Customizer the pending changes will be autoloaded. A button is provided to discard changes to restore the Customizer to the last published state. Addition of global notifications area (#35210), panel and section notifications (#38794), and a notification overlay that takes over the entire screen in the Customizer (#37727).